President Michel Suleiman’s changing position on Syria has recently become more evident through several of his actions according to political and parliamentary sources. Suleiman also did not contact his Syrian counterpart to congratulate him on the occasion of Eid el Fitr at the end of the holy month of Ramadan, last month. The last contact between the two presidents took place after the blast, which occurred in a building of national security in Damascus, according to al Akhbar , a pro-Syrian regime newspaper. In the past there were weekly phone calls between the two presidents, as well as regular harmonizing on political and security issues, according to the diplomatic sources. Similarly Prime Minister Najib Mikati’s policy of disassociating Lebanon from events in Syria showed his lack of commitment to it. He did not object to a decision to suspend Syria’s membership in the Organization of Islamic Cooperation at its recent Mecca Summit. In addition, sources cite Mikati’s request Monday that Lebanon’s Ambassador to Syria Michel Khoury file a complaint to the Syrian Foreign Ministry as evidence that he is distancing himself from the disassociation path. MiKati requested Khoury to submit an urgent letter to the Syrian Foreign Ministry informing it of the “continuous shelling that is targeting Lebanese border towns from nearby Syrian military outposts, as well as warning the Syrian authorities on the negative repercussions that these violations might lead to specially since security measures have been taken by the Lebanese army to protect Lebanese citizens, ” National News Agency reported on Monday. According to the sources the relationship between the Syrian and Lebanese leadership will deteriorate, especially if an indictment is issued condemning Samaha and the Syrian officials of plotting terrorism. The sources do not rule out a Lebanese recall of its ambassador to Syria, which would prompt Syria to withdraw its ambassador from Lebanon and would have serious repercussions on the relationship between the two countries. Suleiman, Mikati and Progressive Socialist Party leader Walid Jumblatt form the centrist bloc within the cabinet. They make up a third of the Cabinet, and thus have veto power against measures decided by the Hezbollah led March 8 alliance which controls two thirds of the cabinet and which backs the Syrian regime in its crackdown against the Syrian people. Progressive Socialist Party leader Walid Jumblatt was the first to distance himself from the Syrian regime and has been the most outspoken critic of the brutal crackdown that has been going on since March 15, 2011, according to the sources. 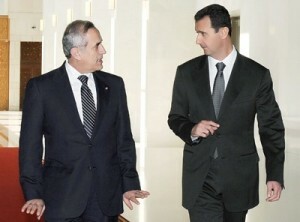 Lebanese opposition March 14 has been calling for expelling the Syrian ambassador to Lebanon. According to the sources Suleiman may approve the expelling of the Syrian envoy if March 14 MPs succeed in the parliament in securing the votes needed to get the bill approved. As for severing ties with Syria, the sources say this would require a highly unlikely Cabinet decision. However, recalling the Lebanese ambassador to Syria would only require agreement between Suleiman, Mikati and the foreign minister. The problem is that Lebanon Foreign minister is a member of the Amal Movement which is headed by Speaker Nabih Berri, a staunch ally of Hezbollah and the Syrian regime. Mansour has been accused on several occasions of acting on orders from Syria. He has also been the most outspoken official against expelling the Syrian envoy. Severing ties with Syria could lead to the closure of the countries’ mutual border. This could have negative implications for both countries since Lebanon depends on the border to export its products to the Gulf Arab countries and the Syrian regime depends on Lebanon to stay in contact with the rest of the world. Most flights to Damascus have been suspended. ‘Lebanon depends on the border to export its products to the Gulf Arab countries’……….. Haven’t the heard of planes!!! Close the border and let them implode. We do not need them and we can survive on our own. There is always a way. Why the surprise anyway, should we always brown nose the syrians! Stuff them, it should be the other way round. They should all kiss Lebanese a$$ for educating them! A better option, let’s start the peace talks with Israel, then see how the Syrians are going to be scared. HA cannot be against peace, the whole people (especially people of the South) want peace and prosperity and stability. If HA is against peace with Israel then they are against the interest of Lebanon and the Lebanese people, specifically the residents of the South who are going to benefit the most from this peace. Dreaming again Constantine … I do it over scotch … and Nastyrallah’s unreasoned hate for Jews of whichever sect would never allow him to even think about that. Might just as well ask Supremes to hold peace talks … when all think they are the Supremest of God’s gifts to the people of earth. This is our biggest problem: That is people in charge of this country do not know the best interest of this country and do not seek it. Egypt and Jordan knew that in their best interest is to make peace with Israel, but Lebanon, with ALL the educated people in it, does not know this reality. Why ? Because ignorants are ruling us. HA are ignorants, they don’t know their own interest let alone the interest of the whole country. And for your information 5th Drawer ALL Projects (small and big) start with a DREAM a VISION, when you stop dreaming LIFE STOPS. When the dream is there then you need a LEADER to accomplish the dream. The Lebanese are forbidden to dream and the same oppressors of dreamers do not allow any leader to emerge. So in our country there is no dreams and there is no leaders. BUT I WILL CONTINUE TO DREAM AND SEE PEACE AS A REALITY as nobody controls my mind or my mouth or my writing, and it will happen sooner or later. With Assad’s fall, maybe sooner than later.